Delvon Lamarr photo by Daniel Sheehan. It is something we hear all too often in Seattle: A musician who impacts the Seattle scene in such a way as to gain national recognition, leaving for broader horizons in places like New York or Chicago. The long, gray winters sequestered in anonymity and creative solitude act as an incubator of talent and inspired invention, creating art that we are so reluctant, yet so proud, to share with the rest of the jazz universe. Hammond B-3 organist Delvon Lamarr is in a way such an artist. 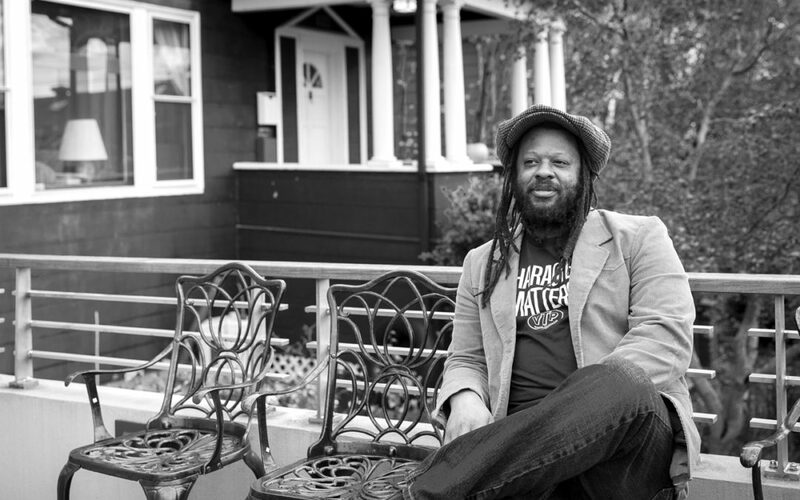 His funk/jazz/soul-inspired Delvon Lamarr Organ Trio has created a crossgenre audience that most jazz musicians are not so fortunate to have. Lamarr had toiled in relative anonymity for 15 years in various configurations on the B-3, utilizing his jazz skills as a trumpeter and drummer and roots in soul music to produce a unique hybrid that speaks to tradition, employs significant jazz chops, and maintains a connection long ago lost in the performance art world jazz has become— a strong connection to dance audiences. The “tradition” of which I speak is broad and variable. The two albums so far produced by the Delvon Lamarr Organ Trio speak to jazz tradition in a very Jimmy McGriff, Lonnie Smith sort of way, while as well touching on the R&B and soul sounds Lamarr encountered long before he chanced upon jazz music. The session that is the band’s premier recording, Close But No Cigar, unites those sounds into a unique, all embracing allure that has a strong resemblance to what became known as the “Seattle sound.” While stylistically different in some ways, one cannot help but connect the dots back to the B-3-based instrumental musical gumbo that was created in the 1950s, and proliferated in the 1960s by the legendary Dave Lewis. Like so many artists before him, Lamarr’s travels, no matter where they take him, will always tie this native son of Seattle to his roots here. The rest of the band, longtime guitarist Jimmy James and new drummer Doug Octa Port, will remain in Seattle, making DLO3 a touring band exclusively. This has been facilitated largely due to their fortunate tie to the renowned Kurland Agency, who sought out and signed the trio. DLO3 will play New Year’s Eve at the Triple Door, serving in a way as the band’s farewell performance as a Seattle based entity. Lamarr did not evolve musically from a prominent high school program. In fact, his only tie-in to academia in music took place in middle school. “I basically lied my way into music,” recalls Lamar. “True story. In middle school you have to take a cooking class, piano, or guitar. This was at Mercer Middle School. I didn’t want to cook, so I took guitar. Sam Chambliss was the teacher there. One day I saw a horn on the floor, and didn’t even know what it was. I told Mr. Chambliss, ‘I can play that.’ He said, ‘Good, I’ll put you in band.’ It was a baritone horn. I picked it up and played it naturally right away. I couldn’t read music, so I would just copy the person next to me. Whatever they played, I played.” He would as well go into the band room, open up cases, put together instruments and just play them, conjuring musical ideas that seemed natural to him. He eventually settled on trumpet, and started playing drums as well. Lamarr’s innate prowess was based on a superior ear and an intuitive musical sense. Music was a language that made sense, and Lamarr was learning in a very personal way: in the oral tradition. He began to make the rounds at local sessions, and a young Lamarr began connecting with the who’s who of the Seattle jazz scene.“I used to take the trumpet around, and that’s how I met Thomas Marriott, Jose Martinez, and cats like that,” he says. Soon he began getting calls from leaders as a drummer, and, as a fortunate stroke of fate, found himself playing on a gig with B-3 organist Joe Doria. “Joe Doria called me for a gig,” he recalls. “I had never seen anybody play the organ. I was playing mostly drums at this point. Joe called me to play at the Art Bar on Second Ave. I was sitting in for John Hicks, Dan Heck was on guitar.” On and off for a year, Lamarr observed Doria’s formidable technique. It would serve as a harbinger of things to come. “I had been watching Joe play it for a year, and literally sat down and played it like I had been playing it my whole life,” says Lamarr. DLO3 presents different challenges for Lamarr as a musician, versus his other gigs that lean more on the jazz tradition. While some musicians may have trouble shifting gears as such, it is a purely natural transition for him. “I grew up listening to soul music way before I even knew about jazz,” he says. “When I play DLO3 music versus swinging jazz, the approach is completely different. I intertwine the soul with the jazz and make sense of it.” It makes sense, then, that a DLO3 audience crosses many cultural and generational lines, much like a more traditional jazz audience, while appealing to a varied cross section of musical tastes in terms of genre. “We cross so many genres of music, it tends to appeal to different age groups. We’ve played straight-up metal clubs and blew the house. We play Jazz Alley and the Blue Note. It’s the same response,” states Lamarr. “I want people to be engaged. I don’t care if they’re dancing or not, I want them to be engaged with what we’re doing. That just means you reach people on a deeper level.” That being said, DLO3 is not your typical groove-based dance ensemble. It is groove music with a conscience, or, more accurately, expanded consciousness. Music is experienced three ways: intellectually, emotionally, and physically. So much of modern popular music is indulgent in the latter, providing a true challenge to the modern musician to expand that experience. “It’s undeniable that music is better when it speaks to somebody’s soul instead of just hearing a beat,” remarks Lamarr. There is an unstoppable flow of activity on the horizon for the band: a U.S. tour of the south, New York, and Chicago; a month-long European tour; and plans to embark on a tour of Japan. For Seattle-area fans, this means less opportunity to see DLO3 on their home turf, as well as Lamarr’s other projects, including the superb trio dis- ORGANized with Cole Schuster and Alek Gayton. While the Seattle scene will still be replete with talent despite Lamarr’s departure, there is always an emotional component to losing our own prodigious artists to other locals. Lamarr and Novo have a warm and generous relationship with the scene here, and will be sorely missed. When he returns he will be accompanied by the sounds of the places and cultures he will soon encounter, expressed in what has always come so naturally to him: his music.